A new site called DisplayHack (displayhack.org - not open to visitors yet) is starting up. It's made by a few people from the demoscene (I'm not involved) but I think it's going to appeal to a lot of you, and it could do with an article on QC! Niché-sites are cool. They are good at what they do, they cater to their audience, and they specialize. They’re nichés after all. There are many such sites and while all good and focused, almost all of them either focus too narrow or too wide. 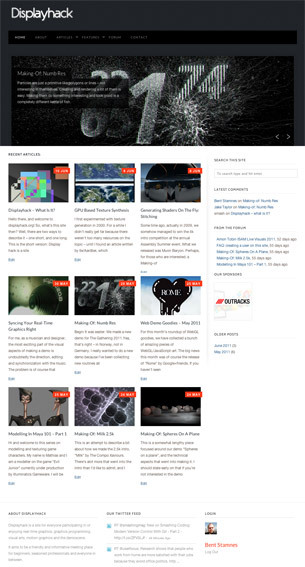 We wanted to create a site where all those interested in the demoscene, web-based graphics, motion graphics, visual arts and other visual fringe technologies could meet, discuss and inspire each other. As long-time demosceners, we know very well that the history of the scene is exactly that: history. If we want to play a part in the next generation of visual artistry, we need to do two things: 1) recruit, and 2) embrace. We need more people to enter the scene, actively, and we need to look outside the traditions of packaged executables downloaded to your computer. The next generation of the demoscene is already here, and it’s on the web, in movies and all around us. Enter Displayhack. It is a site for everyone participating in or enjoying real-time graphics, graphics programming, visual arts, motion graphics and the demoscene, and aims to be a friendly and informative meeting place for beginners, seasoned professionals and everyone in between. QC most definitely needs representing there. I think it needs a least a quick introduction type article - what QC is, the crazy stuff some of us are doing with it and so on. Or perhaps an article on some of the more interesting QC based projects? I'd do this myself, but have major deadline pressure just now, and a demo to finish for the next UK party (currently running as pure GLSL in QC - prepare for retraced landscapes ;) But if anyone is interested in writing something up, let me know and I'll put you in contact with the people running it. And I'll certainly help out if I can (proof reading is no problem for a start). Re: Anyone interested in writing an article on QC? I would like to help write an article on QC for this website. That sounds like fun, how can I contact you? Drop me an email at psonice@gmail.com and I'll put you in touch with the guys who're running it.